These are Absolute SUPER Quality 925 SILVER Pendants. They are So POPULAR in our Every Day Fashion. These Pendants are So LUCKY and Fantastically Attractive to bring two Important Things for its owner: Good Luck and Beauty. Each Pendant is made from Highest Quality Sterling Silver and Genuine Jade Gemstone. This Silver Pendant holds Silver DRAGON Symbol, which represents GOOD LUCK and WEALTH meaning. This Symbol is Really Old and Popular in China, and used in every Family to Bring Good Luck, Prosperity, Abundance and Miracles. Jade is the Stone of Wealth. Know as a good luck and prosperity charm for centuries. It was widely used as a talisman to attract good fortune and also known to bring good luck and prosperity. Provides wisdom when evaluating issues or problems; and brings needed energy, which is so important in managing the Business or Just making Money in general. Jade has been treasured in China since 2950 BC, where it was considered a Symbol of Love. Jade is a stone of the heart. So, of course, it can attract and enhance love. Jade increase a persons capacity for giving and receiving love. It manages passionate feelings. 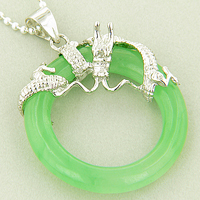 Jade is given by lovers as a statement of their love and devotion to each other. Jade is also a stone of fidelity. Unfortunately there are many people out there who does not get happy for you, when you are the winner. This makes them to have Evil Eye or even Evil Magic against you. Protect your Self for Good. Jade was considered to be the Stone of Magic to the ancient Mayans and Aztecs. Dispels negativity and thought to provide protection from one's enemies. Helps the wearer to sense the truth in all situations. Jade is said to bless the one, who touched it. It helps bring serenity to the mind by releasing negative thoughts. Jade will protect you and also will mirror back the Evil Eye.